This card is horrible and I am not happy with any piece of it. So please do not feel that you have to comment this card, I understand. I am not good at making sympathy cards. Usually if I need a sympathy card I make a quick dash to Hallmark and buy a card. These are the hardest cards to make. I don't like the saying going side ways and I'm just not pleased with the whole design. 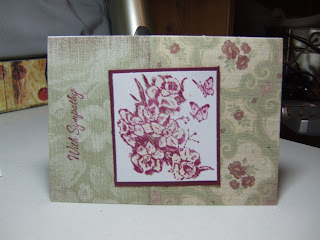 This weeks challenge at Stamps, scraps n' more was to make a sympathy card. Here is my attempt. Chrissy I think you did a wonderful job! I really like your main image, and the paper coordinates so well with it. You are like me I'm my own worst critic. Thanks for playing along again! I knew it! I saw on stamps, scraps, and more that you did a sympathy card you weren't happy with. Why? It's terrific! I made the comment that if you did a card, I was sure it looked nice, and I was right. I think it is stunning Chrissy, I love the vintage feel to it. Really it is amazing Chrissy.